Let’s leave the alt tag on one side for the moment and pose the question; is there a better country band in the UK at this current time than The Redlands Palomino Company? True, they position themselves on the rock side of the genre but where else can you find such delectable harmonies, strong songs, luscious pedal steel and a driving drum and bass backbeat in a tight knit five piece band. Fresh on the back of their fabulous new album BROKEN CARELESSLY, the band has undertaken a short UK tour to promote the record and the evidence of their storming performance in Worcester suggests they are in fine fettle. 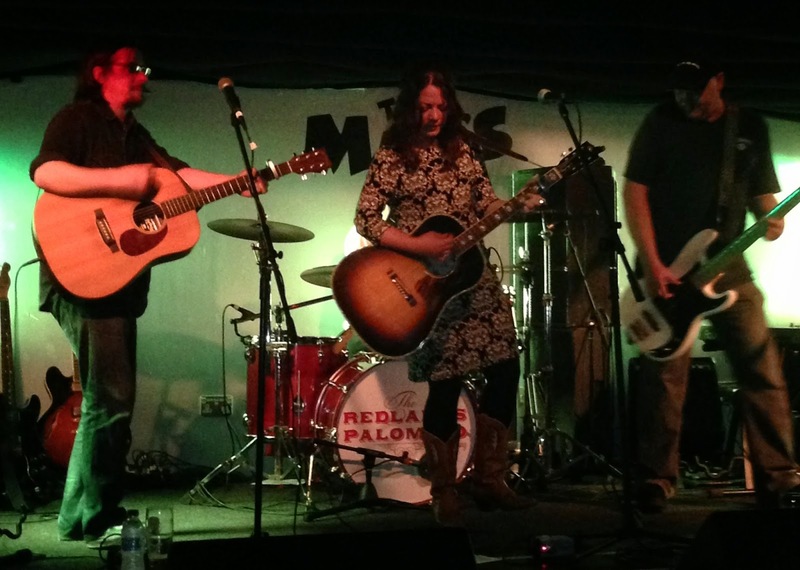 For me, the Redlands experience began in the Marr’s Bar half a dozen years ago and this compact city centre club hosted the band again, giving those present the joy of hearing many of the new songs live for the first time. It didn’t take long to deliver the tracks from the latest album as, without any unnecessary introductions, Hannah launched into ‘Broken Carelessly’, the title and one of the stand-out tracks from the new record. Soon to be classic songs flowed from the album with ‘Solitary Strangers’ and ‘Everything I’m Not’ being particular highlights. 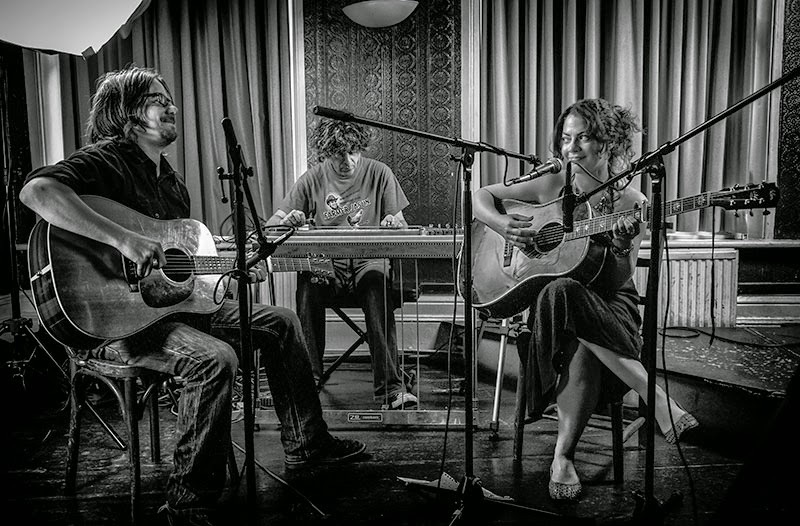 Although husband and wife team, Hannah and Alex Elton-Wall are the architects and heartbeat of the band, you cannot fail to be impressed by the multi-talented musician Dave Rothon who has added song writing to his pedal steel, keyboard and guitar artistry. His 60’s west coast revivalist number ‘She Can Live Without You’ echoed with pure nostalgia to sync with a band sound that tips its hat very much down the Gram Parsons road of the country highway. At this point it would be remiss and inappropriate to ignore some electrifying pedal steel picking by Rothon on ‘Don’t Ever Let Me Down’. As usual with any Redlands gig there are moments of genuine heartfelt tomfoolery but when the band gets in their rhythm, with significant assistance from Rain on bass and Dan Tilbury on drums, you scratch your heads as to why they remain relatively undiscovered by the masses. Perhaps opportunity hasn’t always shined kindly on the band but their current alliance with the Clubhouse stable suggests they are not far away from a driving influence. One such song previewed during the set was ‘Sunday’, a track exclusively selected for the label’s Record Store Day release. Redlands' back catalogue is not the most exhaustive collection but three old favourites never seem to leave their live set and it would not feel right to see the band without listening to ‘She Is Yours’. ‘Wasted On You’ and their pre-encore number ‘Take Me Home’. For this evening we went back a little further with ‘Get On The Train’ from their 2004 debut album as well as hearing the only cover in the set, a version of ‘One A.M.’ originally recorded by country rock legends The Dillards. Amongst occasionally frivolous chat which adds to the band’s laid back demeanour, Hannah was bemused about the current single ‘In These Lines’ being accompanied by an explicit banner on download sites but this misunderstood track is proving popular in being the showcase song from the new album. However for me the true gem of the record appeared in the encore and repeat listens to the lyrics of ‘Band Song’ reveals a soul to their music and a line straight to the heart of pedal steel lovers. Of course there was still time for the band to pay homage to Neil Young in their standard closer ‘Doin’ It For The Country’ and put a crown on another first class performance by The Redlands Palomino Company. Hopefully the fortune of opportunity will look favourably on this great band in the future with both tours and albums being not so far apart. However we can but live in the present and enjoy the current rich pickings from BROKEN CARELESSLY and catch the band whenever we can. They are standard bearers in this country for a sound immortalised in American heritage.